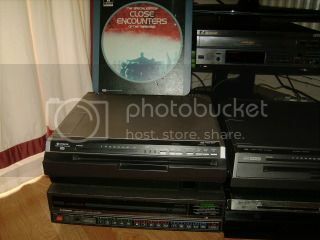 What make's Laserdisc players good? Like are they better quality or anything than dvds? They look like a novel thing to have around the house now but not much more unless I'm seriously missing something. 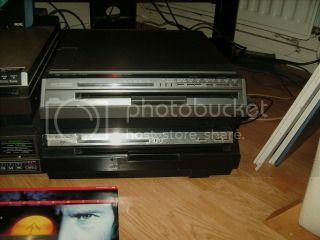 commanderkaiser wrote: What make's Laserdisc players good? Like are they better quality or anything than dvds? That's a complex question and someone might write you an essay as an answer, but basically Laserdiscs are an analogue format without any form of lossy compression and you don't get the sort of MPEG-2 artefacts that DVDs suffer from, particularly poorly encoded ones. On the other hand, they're of inherently lower resolution and only support composite video, although many high-end players implemented comb filtering to give component or RGB output. Ultimately, both formats are only as good as the quality of the mastering, and there are some films that are superb on one format, but poor on the other so it can go both ways. Also, I've got a big pile of laserdiscs some of which I simply couldn't get on DVD for love nor money so I won't be retiring mine any time soon. i get mine off a great seller on ebay, she is real good, even sells sealed ones, i just got titanic double disc off her for £1.99 sealed new plus £3 postage, but she has loads of them always. 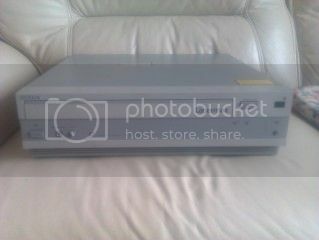 Just been out this morning to collect 2 X CED Disc players (hitachi and GEC ) 90 ! discs all for the grand price of £40 total ! ly i want one...they do now. Probably gonna have to sell stuff and go the ebay route as i can't see anothet turning up in the wild in the near future. Any time anyone asks me what a laserdisc is, I point them to James Rolfe's video. Really interesting! I had no idea laserdisc was an analogue format before I watched that. I can get my head around how a vinyl LP works, but I still don understand how you record a picure and sound on a disc and read it back with a laser?! He's also done a CED video, although he doesn't do a brilliant job of explaining how it works. I remember first seeing a laserdisc in a high end Hifi store. They had it hooked up to a massive 60" rear projection TV and surround sound setup. Incredible! Bare in mind, we had a 20" TV at home with a crappy VHS VCR. 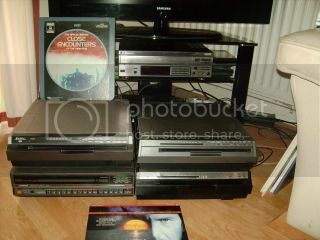 Here is my collection of 6 Assorted laserdisc players, all in good working order. Location: Scunthorpe aka sunny scunny!! - "still barking at the silver moon!" 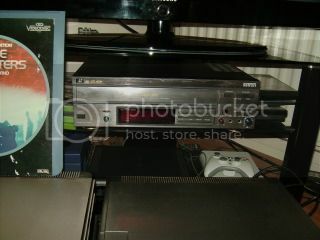 Great pics Oldtimer...well i've stumped up for a CED player...Hitachi....with one disk...so starting from scratch again. Will get into LD when i start selling stuff again...actually sold a few good GC games to get the cash together for the CED. I'm thinking off selling a lot of my game stuff to get into laser as movies are more my thing these days. Also collect HD DVD...got a dedicated Toshiba player for £20 from a junk shop a while back. Might start to collect VCD as i have a cdi..bought one original VCD - 'Swordfish' from a charity shop yesterday...only thing is, i hear all VCDs were full-frame and none were w/s? Wouldn't necessarily stop me from collecting them though. Whats your dedicated VCD player Oldtimer? ive got 100s of CED Discs ruffian, if you want to trade anything , lots of duplicates . Sony Lasermax LDP 3300P Player bought for the sum of ONE POUND! they're a bit of a nightmare if you arent settled into a permanent home, I'm moving into uni halls in september and the only reason my laserdisc is coming with me is its just too friggin big to cart back to my parents house in ireland via public transport... im not selling it tho... glad I only have 12 discs to cart around with me though... its a kenwood player and it is the size of a small car.... ridiculously big and if placed in a suitcase I'm convinced the sharp corners would go through it like mincemeat..